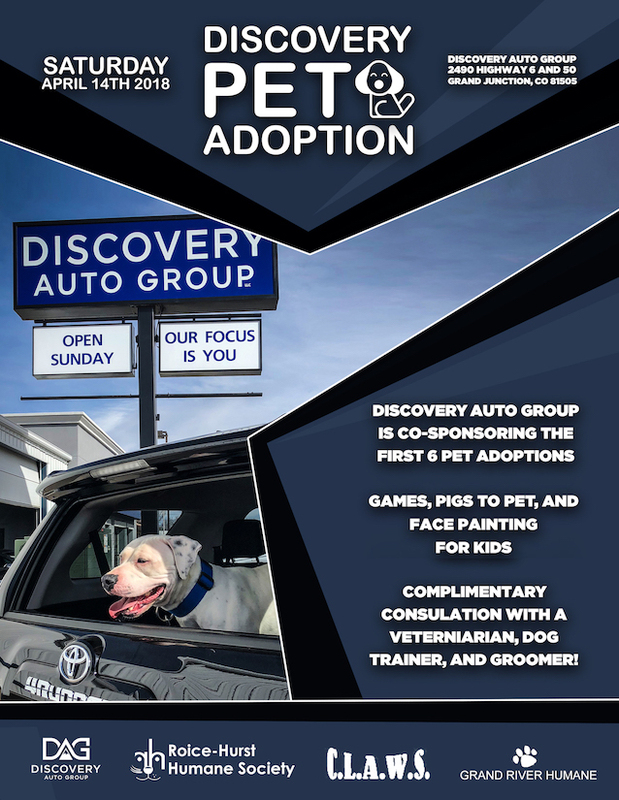 We are excited to announce that we will be hosting Discovery Pet Adoption here at Discovery Auto Group right here in Grand Junction. We are very proud to be co-sponsoring the first 6 pet adoptions! If you have been waiting for the weather to get better to find a new companion then Saturday April 14th is your day to make that happen! We have three different animal shelters coming down and bringing both cats and dogs. This is an all in one place for a group adoption event to provide the best way to not only find the perfect furever friend but to also get a higher education on pet wellness, health, nutrition, training and grooming from local professionals! There will be a face painter for children to enjoy and two wonderful pigs named Hamilton and Oreo to pet and play with. We hope to see many families at this event and to provide some fun games and interaction for the kids while parents look at potential new furry family members! Our goal is to bring knowledge to our community of the responsibilities that come with pet ownership and to find these wonderful four legged companions their furever place in life! We will have much more to come and several announcements as we get closer to the event so please feel free to follow us and hear more as we approach Discovery Adoption Day! We would love to have you share this event and even RSVP on our facebook page.